The first few seconds of 2008 were spent kissing two very special people-- Dash and Tank. I had planned to send them to bed with Dozer at around 9pm. But they were so happy and awake and David was in Panama so why not let them stay up and ring in the new year with mommy? We had nachos and hot fudge sundaes, watched TV and played on the computer (okay, *I* was the one on the computer). They were wired until about 11:55pm. Then they had to force themselves to stay awake for the countdown! Quick kisses, a couple of phone calls and then they pretty much passed out. 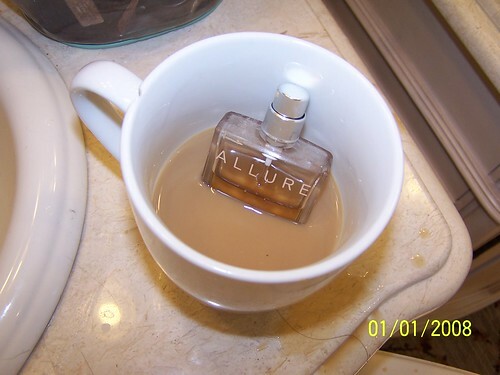 Yes, that is my bottle of perfume nestled into a half a cup of coffee (too bad to ruin that cup, it was perfectly sweetened and creamed!). Weird, huh? I can honestly say that I've never done that before. Anyhoo, the kids rotted their brains watching TV for a while and then they played outside in their pajamas and mud boots. They had fun with their remote controlled boats (courtesy of crazy Uncle Stephen and Aunt T) in the pond and then ran back in to watch more TV. Yup, total brain rot was impending. But it's a rare treat so they took advantage-- they know all too well that our lessons start up again tomorrow. Since it is the New Year and all, I would like to mention that this uptight and fearful mommy did let the kids enjoy fireworks in the backyard for two nights in a row! David being home helped their pyro cause greatly. It is amazing how my laid back husband completely balances me out. I think the kids would have zero amazing fun without him... if it were just me, they would only have mediocre fun, with him it is amazing fun. Come on, y'all know what I'm talking about. The boys wanted me to take pics of them like there were explosions behind them... What do you think? Does the danger seem real? Needless to say, the days leading up to 2008 were a BLAST!